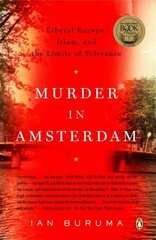 Murder in Amsterdam 0 Edition A revelatory look at what happens when political Islam collides with the secular West Ian Buruma 's Murder in Amsterdam is a masterpiece of investigative journalism, a book with the intimacy and narrative control of a crime novel and the analytical brilliance for which Buruma is renowned. On a cold November day in Amsterdam in 2004, the celebrated and controversial Dutch filmmaker Theo van Gogh was shot and killed by an Islamic extremist for making a movie that "insulted the prophet Mohammed." The murder sent shock waves across Europe and around the world. Shortly thereafter, Ian Buruma returned to his native land to investigate the event and its larger meaning as part of the great dilemma of our time.